Video: Rob Parker questions Robert Griffin III "is he a brother or is he a cornball brother?" In all of the debatable moments in the history of First Take, this is one of the most debatable. Weekend First Take "star" Rob Parker offered bizarre commentary about Washington Redskins QB Robert Griffin III that is unbelievable even by Rob Parker's standards. It all started because of a First Take debate on quotes RGIII gave USA Today about not having to be defined by his race. Parker began the discussion on RGIII's comments and floated the question asking if RGIII was "a brother or a cornball brother." Parker then threw out speculation and questioned RGIII for being a Republican and having a white fiance. After a question from Skip Bayless, Parker then affirmed RGIII was a "brother" because he wore braids. Stephen A. Smith came on directly after Parker and appeared as the voice of reason, saying "I'm uncomfortable with where we just went. RGIII, the ethnicity, the color of his fiance is none of our business, it's irrelevant, he can live his life any way he chooses… I don't judge someone's blackness based on those types of things." Simply stunning. The worst thing about this clip is Parker being so watered-down in his appalling comments about everything from RGIII's hairstyle to him having a white fiance. Parker doesn't criticize RGIII for having a white fiance, but he uses it as a stepping stone to question Robert Griffin's authenticity and in the words of Stephen A. Smith, his "blackness." Are we really making judgments and insinuations and raising speculation about people and their character based on how they wear their hair, who they marry, and what their political beliefs might be? Is this real life? The rest of the panel questioned Parker throughout the rest of the segment and First Take host Cari Champion even later asked Parker, "Why can't he just be who he is?" What a remarkable thought! What an embarrassment and an insult to Robert Griffin III, a man who has done nothing but be a model citizen and athlete. How can ESPN defend their integrity and their brand when Rob Parker, a man they have continued to promote and feature on network airwaves, asks of Robert Griffin III, "is he a brother or a cornball brother?" If this is the present and the future of "Embrace Debate" then ESPN has some serious soul searching to do. It's your move, Bristol. 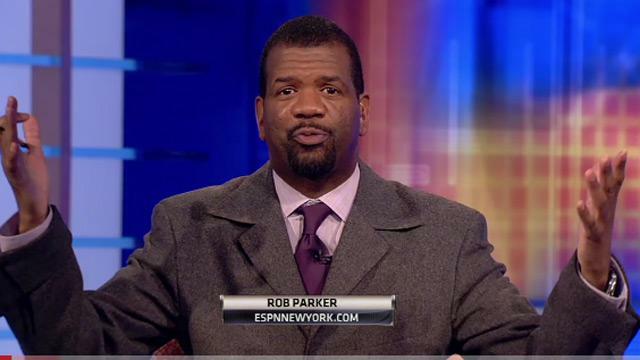 Pingback: What happened to Rob Parker's MLB Network segments? Pingback: This Week In Hot Takes: Rob Parker calls Boston "The B.C.O.A.T., The Biggest Cheaters Of All Time"
Pingback: This Week In Hot Takes: Skip Bayless: Celtics "exposed for what they were"